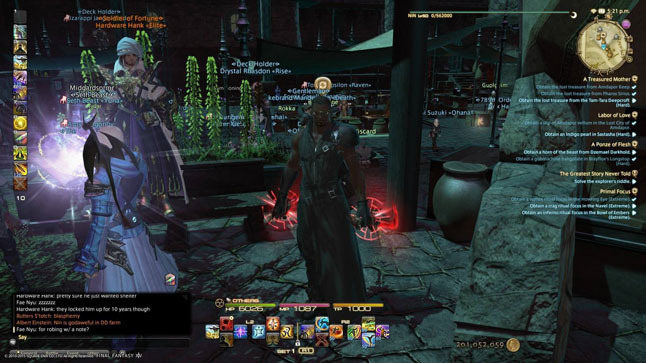 In Final Fantasy XIV: A Realm Reborn, gil is the main source of currency. Every adventurer wants it. However, the question like “how do I get it” always bother players. There are many ways to go about making money, so I’d like to lay it out, wish to help you with a fair chance at being absurdly wealthy. If you have just started playing, or are making a new character, Gil should not be something you struggle with. The main story is a great source of income, as well as job quests and any other side missions you pick up along the way. Gear comes in at a steady pace as rewards, so you rarely need to buy your own and dungeons can be farmed for higher level stuff. If you do find yourself in a bind, maybe spending too much on teleports, you do have a few options. Certain Leves can be run over and over, giving you gil each time and depending on the speed of completion and difficulty, this gil can be anywhere from 500-2000. Mid level players (25 – 40), can also farm enemies for materials that Crafters would use. One of the easiest ones is the actual crystals. They drop from the Sprite enemies that are found in basically every zone. The drop rate isn’t out of this world crazy, but an hour of farming Wind Sprites near Costa Del Sol can net a lucky player 20,000 Gil. Once you reach 50, a lot of potential options open up for you to make money, although they might not be obvious right away. Disciples of War and Disciples of Magic can farm enemies, in the same way as described above. Crafters always need more materials, so this is typically a steady supply of income. Desired items vary per world, but it usually isn’t hard to figure out what the people need. Fleece, Diremite Web, Crystals, Clusters, and many other items can be found on enemies. Killing enemies isn’t the only way to make money. Dungeons like Ampador Keep give you Tomes of Philosophy upon completion. Although these are typically used for gear for your character, there are also crafting materials that can be bought with them. These are Highly sought after by Crafters to make end game gear. A single one of these can be sold for as much as 50k, depending again on your server. Spend a couple days doing some Dungeons, and it is not unreasonable to make over 300,000 Gil! Just like the real world, players can make fast, easy Gil if they simply pay attention to the economy of the game. Item values will fluctuate up and down on a regular basis. People who keep an eye on these trends can buy items when they are low, and sell them as they go back up. A risky maneuver, but if you play it safe, it can be a steady stream of Gil. 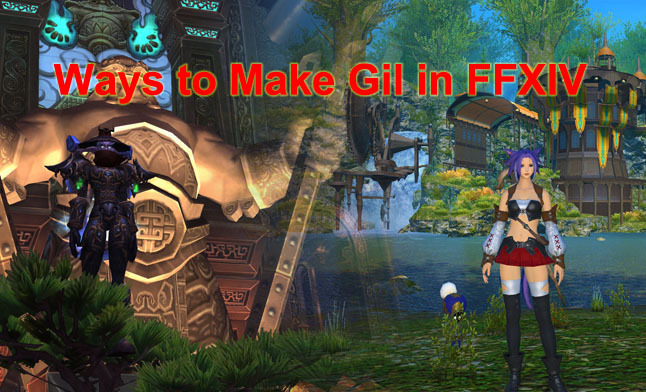 Another big tip for making quick, small amounts of gil is: Players pay for convenience! A quick buck can be made buy purchasing items from an NPC and reselling them on the Market Board. When Crafters get in the zone, they don’t want to be bothered with teleporting around to find the cheapest materials. They will pay a premium to get it quickly, and that is where you come in. Go to NPC’s and purchase mass amounts of low cost items, like Leather, or Cotton. Sell it on the Market board for a few Gil more per item than you paid, and sit back and watch as you make an easy 1 – 2k Gil. Playing as a on of the Disciples of the Land can make you easy Gil. Aside from the gear they use to collect items with, they have very few costs. This means that what they mine or harvest can be sold for pure profit. Right now, Miner is all the rage for making Gil, as they have one of the easiest times collecting Elemental Shards, Crystals and Clusters. Even at level 1, this class can make you 10 – 20k an hour. Spend some time to level it up and eventually you will have a class that can make you very easy Gil. Crystals and Shards are not the only valuable item. All three of the Disciples of the Land have high level materials that they can get a hold of. With proper gear, your character will be able to collect HQ materials on a regular basis, netting you a much larger profit at the Market Board. With all that said, Fisher is probably the lowest of the three in terms of money making potential. Don’t take that to mean it is useless, as that is far from the truth, but compared to Botanist and Miner, it just doesn’t generate the same amount of money. If you are looking to make some serious Gil, this is where you want to be. Almost any of the various Disciples of the Hand can make you money, however the more you level, the better off you will be. The reason for this is very similar to that of the Disciples of War. Like their fighting counterparts, Crafters have many cross class skills they can make use of. The more you have access to, the better chances that you complete those high level crafts, and more importantly, the better the chance of getting an HQ. For this reason, if you really are looking to make some serious dough, don’t be content with leveling just one Crafter, level as many of them as you can. Given how much materials cost, how do you actually turn a profit? Well, it is actually easier than you might think, as it comes back to a point further up this page. People will pay for convenience, so you can make easy money by crafting low level materials. Let us look at Weaver as an example. Cotton Yarn needs to be crafted from Cotton Bolls and a Lightning Shard. A low level Weaver can make quick money by turning the Cotton Bolls into Cotton Yarn, and then reselling it. This is because higher level players don’t want to waste time making the Cotton Yarn. They simply want it immediately, so they will pay a premium to buy it, instead of making it themselves! This is a great way to sustain yourself until your Crafter of choice reaches the higher levels, and can make end game armor and HQ items. Once you reach the high levels with your desired Crafter, probably the single best way to make quick Gil is to make HQ items. Your stats will now be high enough that you can go back and HQ most low – to mid – level items. This means any item up to around the low 40s should be very easy for you to craft HQ. Grab some materials, and whip up a couple dozen HQ Linen Yarns, or maybe some sheets of HQ Undyed Velveteen and sell them for massive profits. The only way to truly make tons of Gil is to do everything yourself. Level a few classes that complement each other, and turn a huge profit off the items you can make. For instance, right now one of the best combinations is an offensive Class with Weaver and Miner. As a level 50, you can farm Banemintes. They will drop Diremite Webbing. As a level 25+ Weaver, you can turn that webbing into Dew Yarn. Then, take the Dew Yarn and turn it into Undyed Velveteen. Sell the Velveteen, and all the money you get back will be 100% profit, since you spent nothing on the materials. Eventually you will run out of Lightning Shards, and this is where Miner comes in. When tapped out, take the Miner out and farm some Lightning Shards around the Ul’dah area. This is viable at level 1, but once you hit 20, the shard yield will double, making it much more efficient. With those three Classes, a player can farm, craft and mine a steady supply of items without ever having to purchase anything from the Market Board. As your crafter levels up, the chance to HQ will also increase, making you much more Gil per synthesis and as Miner increases, you will farm shards faster, resulting in less time spent having to collect them. This isn’t the only combination of Classes that can pull this off either, so look over the Market Board thoroughly to find items with which you execute this same process. And if you want some easy and cheap gils, click here and know more!